In addition to the stories, Jon Stevensn sent some fan art. We're also starting a new little thing today. 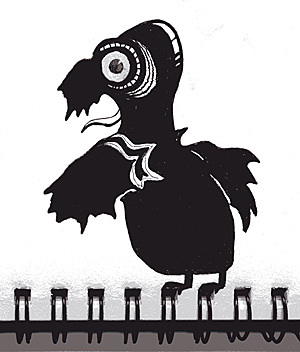 Yesterday I got an e-mail from Charlotte Saylor: I would propose a small side project where you post one of the inkblots in a downloadable file that people could print and draw the monster they envision. It would be interesting to see how people create differently from the same source material. Is there but one type of monster to be born from each initial canvas? Monster 99 has secrets. It's a creature of questions! Where did it come from? Where is it going? Where is the rest of it going? Who are those little guys on deck? Where is all that liquid coming from? What's with the bubbly exhaust? Why the giant teeth? What is its purpose?! Please! Somebody!! TELL ME!!! As you know, there will be a book about this whole series and you can't get into the book if you don't post a story. So if you haven't joined in the fun, this is your chance. This is almost it. Only one more Daily Monster left to go. Please join me one more time tomorrow for the Grand Centennial Finale--- the 100th Daily Monster. For the love of blown ink, don't miss it! Melvin, sage prophet of the local Monsterage, said; Eat, stink and be wary, for tomorrow the end shall come. Loose not your heart for we shall all be immortalized in a book, soon enough. “Errr…” A sheepish grin spread over his face. He didn’t really know what the others had been talking about he never did but he liked to tag along, feeling part of something greater. They had a habit of scaring old ladies and snatching skateboards from young kids, making them cry. He was the scariest of them all had the biggest teeth, you know. This very instant, he was pretty unsure about that place as scariest gang member. He was asked for an opinion, and had no clue about what. He’d been admiring the ducks in the pond. The others were looking at him, with their wicked grins and twinkling eyes. “I’m finished,” he thought, and tried to grin along. He still had the biggest teeth, but teeth aren’t enough to scare someone these days. “Hey, Toothy, what’s your idea? Or do your teeth take the place of your brains?” their leader teased. The others howled with laughter. Toothy grinned along, but secretly wished he would disappear into a puddle. He did not want the others to witness his usual disappearing act when confronted with shameful experiences. He tried to hold on to his head, but it was too late: in a desperate attempt to get out of this messy situation it chose to fly away. What was left of Toothy scurried away into the pond, fleeing the bursts of laughter from his former friends in crime. You are a professor and you bank on brains. You are a circuit breaker. You are the conduit. You are the nerve and the synapse. You are the truth and the light. The university is the collage of your scrapbook; pension plan students. 401 equations. You are the residue and the substance you are the resistance and the give, you are the redux and the text and the origination and the end and the repetition of the same and the same and the same. You know our names when we sign up for your class and you know us when we say something riveting and timeless. Otherwise, you forget us, or worse, you ignore us unless we somehow impress you with our desire for your knowledge. Subjectivity is out the window. The professor listens with intent. We wonder how much she thinks about us after class. We wonder if the professor knows how much we give to her. We wonder and we wonder and the professor goes home and listens to the news and watches TV and reads through the next draft of her forthcoming novel. We walk to class and drive to class and think fully of the project we wept over, wrote and rewrote and gave up on. The professor arrives late with a latte in her hand. She strokes the sides as we argue our perspectives. You think about the future of us. You are nothing without us and your jaw chews the food we provide you. You cannot sleep or eat without our synapses, our circuits, our repetitions, our intrigue, our desire. You are nothing without us; you are a homeless monster, a consumer, a Republican. You are a politician and an endangered animal. You are the truth and the light. Until I went to school. Ok, I’m coming, don’t leave the monster body without me. 99 (or 66 when he’s doing a headstand … which, incidentally, he had never done – even when high and despite the goading of a good deal of his friends) had an immensely sensitive sense of smell. So fine was this sense of smell that he worked in the back office of both Estee Lauder and Chateau Lafite. You see, 99 had such a finely tuned sense of smell, that he was in demand from ‘smell salesmen’ from the wine business to the perfume business the world over. At college, aged 159 (late teens for a monster like 99 – the hormones still raging, anything possible in later life) he was seconded to a large supermarket out west. It was here his sense of smell took on an economic value. He could predict good days for sales and bad days by the aromas on entering the shop. Sure, the smell of fresh bread helped bread sales but CD sales suffered dreadfully. The vaguest smell of fresh fruit – rather perversely helped the sales of toilet roll and did little for fruit sales. These smells (99 preferred the word aromas and as he’s a nice guy let’s stick with aromas). These aromas were imperceptible to most but they had a huge impact on sales – and 99 was the only guy in town who could get his snout round them. So you can see why the retailer wanted to keep 99. But he wanted more. He wanted to smell more. His smell vocabulary, his aroma portfolio, needed fleshing out. After college, 99 had his eyes on Europe. He ended up in France. Working for arguably the world’s most famous wine estate, Chateau Lafite, 99’s nose was revered across Bordeaux and financially very well endowed. Blending wines with Charles Chevallier was a treat, with Charles’ palate and 99’s nose – Lafite was riding a crest of a wave. Until 1982. 1982 was a fine vintage but it was also the year 99 developed an allergy to wine. Imperceptible amounts would cause his head to literally abort his body – fly off. 1982 was also the year monster 82 was graduating from spy school. Proud, and getting used to his high-rolling lifestyle 99 keep his allergy secret. Taking antihistamines to deal with the allergy to wine, he’s blend merrily with Charles. But the tablets affected his nose. He had a bad nose. His nose had gone. 99’s nose was 99’s future – his life. And now 99’s nose was a non-nose. No nose. 1982 turned out to be one of the worst wines Lafite ever produced. 99 had flown out of France before the wine was tasted by critics to return to the US. He could tell from Charles’ eyes that he’s goofed. 99 never made the plane home. He made it only half way to Bergerac airport where he was dispatched by a ruthlessly efficient killer. That killer was monster 82. 99 had ruined the 1982 vintage that bore his name. Lovely to see some old footage of him though. Ladies and gentlemen, welcome to the Comedy Cave. Our first comedian is so funny, he’ll kill you. So please laugh anyway, cause if you don’t, he’s gonna kill you anyway. Please put your hands together, if you can reach ’em, for Mr. Henny Moungster. Thank You. Thank you. Let’s hear it for Frankie, our host. They just don’t make ’em like him anymore. Let’s thank the artist for that. Ha. I just flew in from the coast, and, man, are my arms tired. The hotel they have me staying at here is really nice, but I’m a big guy. I’m not saying the rooms are a little small, but when I put the key in the door, I broke the window. Comedy fame does have its price, you know. All night long there was some girl knocking on my hotel room door. Finally, I had to let her out. If I had any blood, I’d blush. But seriously, I’m not really a bad monster. I’m just drawn that way. I said, “Doc, why don’t you come over to my place tomorrow for lunch.” He said fine. He was delicious. Thank you, you been a wonderful audience. Don’t let me catch you following me home, or I’ll have you over for breakfast. Sarah is three. She watches Daily Monster every day after nap and before going to bed. She says this monster is going to get his head back. In the Super Secret Monster Top Secret Service Agency–the SSMTSSA for short–is constantly trying to develop new ways of transportation for members of the Monster Military. The newest development is an attachment to a ten year old project, named simply “The Suit.” The Suit is a large Trojan Horse of sorts. It is a fake monster shell in which three agents can comfortably stay for several weeks while on any number of assignments. The one problem in the past was with transportation. Since the suit is roughly as tall as the Empire State Building (after all, it is a comfortable place to stay! ), it is a feat and a half to simply move it a few feet. The newest attachment for The Suit, Shuttle-Head 256 attempts to solve some mobility issues. Agents can now make their way upstairs to the control room and blast off. After this, any of the two hundred retro-fitted Suits is a suitable landing site. Surveillance capabilities have increased ten fold, and all that is left to do is somehow make The Suit smaller. Plans for suitMINI are in the works, and it should be available within the next year in three fantastic colors. This is no mere mortal monster. This is the pre-cursor to both Inspector Gadget and the Bionic Man. The Snagletooth Megamonstertron was my favorite transformer as a kid. Unfortunately, production was discontinued in 1989 due to slow sales in the US sector. Of course, I held on to mine. I kept all of the pieces too, even the detachable space pod face. Transformers, more than meets the eye. Transformers! These days, relationships with neighbors can be quite complicated. You know, little things that get blown up out of all proportion? Such is CBS’s relationship with Serling as he touches up draft #99 on this thing Matheson turned in called “The Invaders”. He is tired now, and his head is pounding and he finds himself thinking often of the Mind Body Problem. In “The Invaders” there is no dialogue until the last three minutes of the script. CBS thinks: not so much. They balked at the first draft: “Central Control! Come in Central Control! Incredible race of giants here! No counterattack! Stay away!” and then the camera pans down to reveal the lettering on the side of the saucer: “U.S. Air Force Space Probe No. 1”. It’s a total sockdolager of an ending: “The invaders are us!” (Or has he taken that trip to the well once too often?) Serling’s head is killing him. Head on: apply directly to the Moorehead. This is spookily close to what Serling is thinking right now, but he will never hear those words; he will have been dead a year before that movie comes out: stress, smoking, heart attacks. But in this way we can find an answer: the body will be gone, but the head will still fly around, usually in early ante meridiem but also sometimes as a marathon on the SciFi channel, especially when it’s a holiday weekend, especially then, the head is still flying around. Monster 99 was always a rather misunderstood monster. For years, while attending primary school, all the other monsters would taunt him for his lack of a more… “traditional” face. You see, poor Monster 99 – known to his classmates as “Charlie-No-Face” – had little more than a gigantic, toothy grin and two nubs atop his pearly white teeth through which to see the world around him. Charlie-No-Face endured years of taunting, and though he continued to smile through it all, it was only because he hadn’t any lips with which to frown… and no eyes with which to cry. All this changed on the day Charlie-No-Face graduated from secondary school, however, as his parents got him a brand new face as a graduation present. Charlie-No-Face’s mother, Lola-No-Face, had convinced her husband, Ronnie-No-Face, that their son had suffered enough and built up enough “character” to last him a lifetime… it was time to allow Charlie-No-Face to become … Charlie. Charlie-No-Face had found a face that was full of expression, hope, and joy! It was dark in complexion, but its eyes glistened and the entire bit of it could lift off and fly away when Charlie needed to clean beneath the veneer. Charlie thanked his parents ever so much for the chance to be an average monster with a complete face and shiny bright eyes, but later found it to be a far more useful tool than simply “fitting in”. You see… Charlie discovered that having a face that would pull off and fly away at command – leaving only his giant smile and two nubs through which to see – was ever-so-useful for scaring the living bejeezies out of the children he would visit each night. These last two monsters have been a delight, and my apologies for not embellishing my own story upon them (all of these stories have been tremendous). Rest assured you will have something to look forward to on #100, Mr. Bucher. And the kids I was watching tonight were talking about hovercrafts! And they’ve never even seen monster-a-day (despite my best efforts, and bookmarking their folders). This one is a beaut. And the fan art is ace. As is the ink-blot interpretive art challenge! OH NO! i’d post a comment, but my computer’s being a b*tch, and i can’t. but question: will i still be able to access monsters, even though you won’t be posting them daily anymore? Monster 99 is extremely competent at bass guitar but shows no apptitude for the brass section. his influences include nirvana, the smiths, joy division, david bowie and MC Hammer. if you’d like to hire monster 99 for your band just let him know. he will travel and has a passion for thrashing. I love the monster, especially the monsters who where ties. I look forward to the release of your book. Even big and monstruous smiles can be the most passioned! I didn’t know what I was feeling!! Those emotional bound seconds where the finer seconds I ever experienced the last days and you just make me more curiouos every day I watch you standing right next to me. You’re monster made my day ’cause it remembered me old days! Oh yeah I’m a nostalgic! Während des Tages kann man ihm in den dunklen Tiefen der Moldavischen Wälder begegnen. Sein Knurpsen, Sägen, Raspeln und Knacken ist unüberhorbar und weist einem den Weg. Trifft man dann auf Moldovan, wird man erstaut feststellen, dass er weder Säge noch Hammer und auch keinen Bohrer bei sich hat, einzig ein paar Nägel liegen verstreut am Boden herum. Ausgerüstet mit einem multifunktionalen Gebiss, ist es für ihn ein Leichtes, die dicksten Bäume zu fällen und die besten Hölzer zu bearbeiten. Edle Bretter braucht er für die Särge, die er der ortsansässigen Vampirgemeinschaft liefern muss. Als gelernter Sargtischler mit Meisterprüfung, hat er beste Referenzen vorzuweisen. Dieser Umstand, und auch seine perfekten, riesigen mit Hauern versehenen Zähne, haben ihm zu einer Lebensstellung mit guten Arbeitsbedingungen verholfen. Das ist der Grund seines Glücklichseins. Am Tag geniesst er seine Arbeit in der einsamen Stille des Waldes. In der Nacht aber trifft man ihn oft in Gesellschaft schöner Damen, die er an den Blutrausch-Partys in den Schlössern Moldaviens ganz gerne auch mal ausschlabbert.